So we have come up with a list of items that we have found get overlooked when packing the emergency kit, which we think are absolutely crucial to have. It is your big day and you want to look and feel your absolute best. But you won’t enjoy the day if your eyes are dry or itchy. It’s going to be a long day; you start hair and makeup in the wee hours of the morning so you likely have had your lenses on for over 12 hours by the time your reception begins. Make sure you have your lens solution and even a spare pair of lenses so you can keep your eyes nice and comfortable. Remember if your eyes are itchy, or if you get tearful from an irritation in your eyes, you will ruin your make-up, and possibly your photos. We’ve seen brides who usually wear glasses choose to wear lenses on their wedding day. So if you’re a gal who isn’t used to wearing lenses on a regular basis, consider practicing to wear and take off your lenses on a more regular basis in the weeks leading up to the wedding. It will also help your eyes get used to wearing the lenses. And more than anything else, don’t be shy to bring your glasses along. It’s a part of who you are and towards the end of the evening perhaps think about switching back to your comfy pair of glasses. It’ll help you enjoy the evening, and be yourself. A majority of wedding vendors require you to make your final payment the week prior to your wedding day, and the few that accept final payments on the wedding day are usually accounted for by most brides and grooms. However, we always recommend that you carry extra cash. Stuff happens, last minute things come up. Designate the cash to a trusted friend or family member, just make sure you’re covered in case there’s a delivery charge on the cake you didn’t notice before, or if you want to call for a cab last minute. This one is on all the lists and yet somehow seems to always get overlooked. I believe it’s because brides are so focused on the wedding and the guests and making sure everyone and everything is ok, that they forget about themselves. But remember ladies, this day is about you and you have to look after yourself. The adrenaline is high and so you may not notice it but you do need to eat. Plus nobody loves a hangry bride! This one, just like the lens solution could make your life so much easier. Most brides are wearing a brand new pair of shoes on the big day. This could mean shoe bites or blisters especially since you’ll have them on for so many hours. Plus high heels could lead to tired feet. So just throw in a pair of flats, and have them on standby in case you’d like to keep dancing the night away. 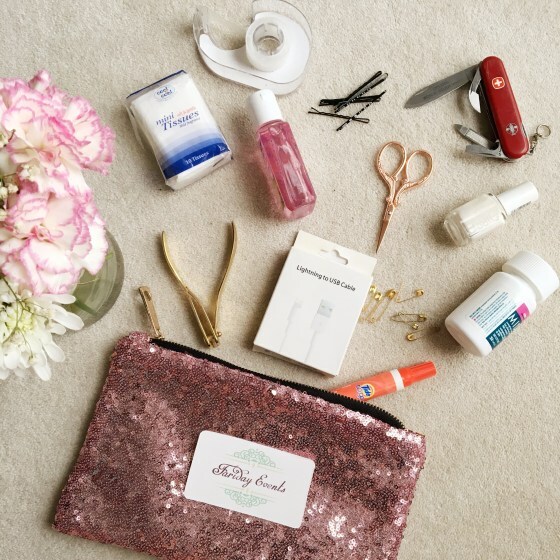 A few times we’ve had brides need a tampon even though they weren’t expecting to. It’s usually a stressful few days leading up to the day, you’re not sleeping right, you’re not eating the same, things happen. You know yourself, but just in case you do need one unexpectedly it’s best if you have the brand and type of product that you usually use. Once again, like most of the above listed items the key is to keep yourself as comfortable as possible. On any other day you can walk a bit longer in the heels that are killing you, or you can use the tampon from the vending machine. But on your big day it’s best to be prepared.